Location: Lavercantière, in the Meurthe-et-Moselle departement of France (Lorraine Region). Notes: The castle of Lavercantière is a castle located in Lavercantière, France.The seigniory of Lavercantière belongs since the tenth century to the family of Gourdon. According to Guillaume de Lacoste, the castle of Lavercantière was taken by Richard Cœur de Lion in 1188. The chapter of Cahors had rights over Lavercantière because Aymeric de Gourdon, a damoiseau, paid tribute to the chapter of Cahors of lands and jurisdictions of Saint-Clair, Saint-Romain, and all the places he owned between the Lot and the Dordogne in 1302. Bertrand de Salviac, of the town of Saint-Germain, Peyrilles, Concorès, Ussel, Home of Gourdon, pays homage to the chapter of Cahors for Lavercantière in 1401. In 1528, the seigniory passed to one of its branches, the Lagrange-Gourdon after the marriage of Marquise de Gourdon, daughter and sole heiress of Jean de Gourdon, Lord of Lavercantière, Rampoux, Saint-Martin le Dézarnat, Saint-Cirq De Belarbre, etc., and Jeanne de Lauzieres-Thémines, with Michel de Lagrange, whose family is from Rocamadour. The seigniory remained the property of this family until the Revolution. 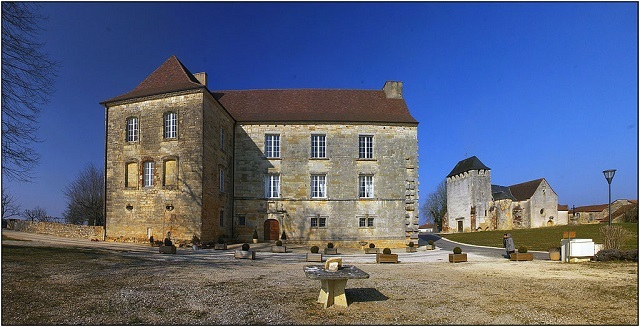 The present castle is entirely rebuilt from the seventeenth century on the foundations of the medieval castle by Guyon de Lagrange-Gourdon. In 1659, he commissioned Pierre Francès, a mason from Rampoux, to carry out the steps of the internal staircase, ramp on ramp. The castle remained unfinished. He had to have a dual-tee plan. It was built only a simple Tee. The western wing of the castle was only built in the eighteenth century. Jacques de La Grange-Gourdon was born there in 1755. Buildings which surrounded the courtyard and which appear on the cadetral plan of 1810 remain only vestiges. The building is listed under historic monuments on September 16, 1991.